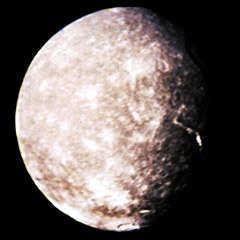 Titania [Ty-TAY-ne-ah] is the fourteenth of Uranus' moons and is the largest. Although it is the largest moon of Uranus, it is much smaller than Triton, the largest moon of Uranus' sister planet, Neptune. It was named after the Queen of the Fairies and wife of Oberon in Shakespeare's Midsummer-Night's Dream. Titania was discovered in 1787 by Sir William Herschel, who also discovered Uranus and Oberon. Most of what we know about Titania was learned from the mission of Voyager 2 when it flew past the moon in 1986. Titania is believed to be composed of about half water ice and half rocky material. It is very similar in composition to Ariel, but is much larger. 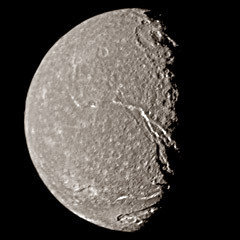 It is also similar to Saturn's moon, Rhea, although it contains a greater percentage of rock. Some astronomers have referred to these moons as "dirty ice balls" because they resemble a ball of ice mixed with dirt and rock. The surface of Titania is littered with impact craters. Many of these craters are surrounded by brightly colored ejecta material. This material was thrown out onto the moon's surface by the impacts that formed the craters. Surface features on Titania range from impact craters to rift valleys and faults. There are a few large impact basins on the surface, but most of the craters are small. A large, double-walled crater is located near the top of the moon. Many of the craters on Titania appear to be partially submerged. This would seem to indicate that the surface is relatively young, and has resurfaced itself at some point in the recent past. Several interconnecting rift valleys can be seen crossing the moon's surface. These are similar to the valleys on Ariel except that they are not quite as extensive. One of these valleys is 1000 miles (1600 km) in length. Several faults also exist on Titania's surface. This indicated that the moon was probably geologically active at some time in the distant past. Some astronomers believe that Titania's surface may have cooled before its interior. When the interior began to cool, it expanded and formed the rift valleys and faults that are visible today. Titania has no atmosphere and no magnetic field.